Sourcing loans from mortgage brokers and other intermediaries requires its own plan. 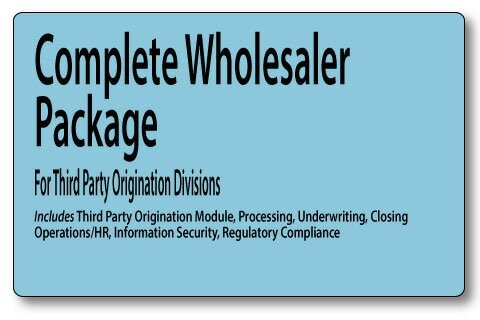 Wholesale Lenders need a guide to distribute to brokers and third party originators defining policies and procedures for conducting business. This program includes broker/correspondent approval, vendor management, pricing, loan file intake, underwriting submission, making and communicating decisions, closing and quality control. Sample forms - fee sheets, registration forms, rate sheets, broker approval documents, loan approval notifications, underwriting reviews - included for customization. Giving you the complete package of tools to manage your third party origination operation.